July 12, 2012 -- AuntMinnie.com presents the final installment of our series on overcoming work-related musculoskeletal issues for sonographers by Doug Wuebben, a cardiac sonographer, along with Mark Roozen, strength coach for the National Football League's (NFL) Cleveland Browns, and Joel Raether, strength coach for the National Lacrosse League's (NLL) Colorado Mammoth. Click on the links to read Part 1, Part 2, and Part 3. In Part 4 of Scanning in Pain, we'll finish up the series by discussing sonography sins No. 7 through 10 and showing some simple exercises and basic stretches that can significantly help some of the problem areas for sonographers. Ergonomic aid: Avoid resting your wrist on the ultrasound control panel. Performance aid: If you remember from the last article, flexion is a position that is made possible by a joint angle decreasing. The bones, connective tissue, and muscular systems work together to move the joint into a "flexed" position. For the wrist, an example is when you hold your arm straight out in front of you with your palm down and move your hand down toward the ground. The opposite is extension, or straightening the wrist back up and bringing it toward the ceiling, still keeping the palm down. Flexion decreases the angle between the bones of the limb at a joint, and extension increases it. A simple way to increase wrist stability and strength is to strengthen the muscles around the wrist and the forearm muscles that support the hands and wrist. Wrist curls: These work the top side of the forearm, along with the wrist muscles. Use light-to-moderate weights, and avoid overstretching to prevent injury. To perform this exercise in a sitting position, rest your forearms on the tops of your thighs (for greater stability, kneel in front of a bench and rest your forearms on it). 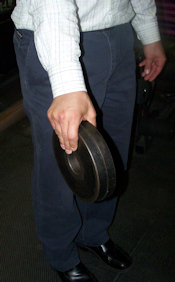 Weights or resistance (such as a band) are held with the palms facing downward. Lift the resistance, moving only your wrists, and lower the resistance to the starting position. Start with one set of eight to 10 repetitions and build up to two to three sets. Reverse wrist curls: These work the bottom side of the forearm, along with the wrist muscles. As the name implies, this is similar to doing wrist curls. To perform this exercise in a sitting position, rest your forearms on the tops of your thighs, or kneel in front of a bench and rest your forearms on it. This time, weights or resistance are held with palms facing up. Lift the resistance, moving only your wrists and lower the resistance to the starting position. Wrist stretch: This stretch elongates, aligns, and energizes the wrist joint, the muscles of the forearm, and the fingers. Sit or stand "tall," making sure your back is straight. From this position, extend your arm out in front of you so your hand/wrist is even with your left shoulder, with your palm facing down. Bend your wrist to point your fingers toward the floor. Now turn the wrist so the fingers point to your right. Using the palm of your right hand, gently push the back of your left hand so the palm moves toward the body. Stretch and hold for a count of 15 seconds. Release and do the stretch again. Switch to the other side and repeat. To intensify the stretch, as you are pushing the hand, curl the fingers of the wrist getting stretched into a fist. Ergonomic aid: Try to use a palmar grip for most of each exam. Performance aid: Pinch strength, or grip strength, is often not that important to most people. But in a profession where holding an item for long periods of time can cause problems, it's important to develop strength for holding or pinching an item. In the sports world, some of the best athletes with pinch or grip strength are climbers. By adding one or two pinch- or grip-strength exercise to a program, you will be better able to handle the workload when you need to use a pinch grip. Weight pinch-grip training: For this exercise, hold two weight plates together, back to back. If the weights have a "ridge," be sure that the ridge side is to the inside. You should be holding the weights on the smooth surface. Vary the weight used, starting with two 2.5-lb plates. With both weights held together, maintain for anywhere from 15 to 60 seconds, depending on your goal (figure 1). You can hold the weights statically (in place), walk and carry them, or even perform one-arm rows. Medicine ball grip training: Another fun (and inexpensive) way to train grip strength is to use beach balls or playground balls. By adding water or other material such as sand or lead shot, you can make balls with different weights. You can also purchase sand bags. As with the weight pinch-grip training, you can hold them statically or do movements such as upright rows, walk and carry, or one-arm rows. Begin with 15 seconds and build to 60 seconds per arm. A final option for pinch training is to use heavy books. Spider stretch: To stretch the fingers, start the "spider" by touching your left- and right-hand fingers and thumbs together at the finger tips. Stretch and flex your fingers by bringing the palms of the hands toward each other. Pretend your fingers are a spider on a mirror doing push-ups. Do 20 spider push-ups for one set, and work up to two to three sets. Ergonomic aid: Use proper foot support to stabilize your trunk. Performance aid: In the last article, we talked about our "trunk," or in fitness circles, the core. We reiterated that the core is where all movement in your body begins. It is also the area that helps stabilize and support each segment of the body. If our core is weak, it affects how we stand and sit. Except for doing "traditional" abdominal exercises such as sit-ups or crunches, the rest of the core is often neglected and not part of a program. By building a strong trunk, we increase protection for our other body segments and offer stronger "bracing" for the back. An in-shape trunk/core can give support to the spine for almost all movements and activities. Without proper strength, the trunk/core can lead to bad posture which, in turn, can lead to aches and pains or worse, injuries. Sitting leg lifts: For this exercise, sit on a stability ball, also called a rehab ball, or use a chair. While sitting, brace the core -- or draw the navel into the spine, lift the pelvic floor, and squeeze the buttocks. While holding this position and also maintaining your breathing pattern (do not hold your breath), lift one leg off the floor and hold for 10 seconds. Then switch legs, and do this back and forth three times. This is one set; build to two to three sets. Bridges: Lie on your back with knees bent and feet flat on the floor. In this position, lift the hips off the floor, so that from the shoulders to the knees, you form a straight line, all the while bracing the core. Lift one leg off the floor, hold for 10 seconds and then switch legs (maintain the buttock contraction). Do this back and forth three times. This is one set; build to two to three sets. 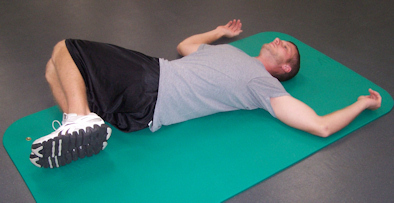 Hip rotation stretch: Lie on the floor with your knees bent and feet on the floor. Work to keep your body straight, but let your hips relax and let your knees drop to the right and rest on the floor (figure 2). Come back to neutral and then drop your knees to the left. Do 10 reps each way for one set, and build to two to three sets. You can also use the back rotation stretch from the last article. Ergonomic aid: Alternate between sitting and standing during exams. Performance aid: Movement is the key to staying strong, energetic, and healthy at work and away from the job. It's been found that moving can help you manage the symptoms of illness and pain, maintain independence as we get older, and even reverse some of the symptoms of illness, health problems, and aging. And not only is movement good for your body, it's good for your mind, mood, and memory. No matter your age or physical condition, you can benefit from getting up and starting some type of exercise program. Obtaining the benefits and rewards of exercise doesn't mean you have to spend hours and hours doing strenuous workouts or making countless visits to the gym. It really is about adding more movement and activity to your life, even in small ways and in small amounts. Whether you are a fitness fanatic, generally healthy, or managing some injury or minor illness, there are many easy ways to get your body moving and to improve your health. For more information on a fitness program or questions about training, you can email the authors at the addresses below. Doug Wuebben is a registered cardiac sonographer who performs adult and pediatric echocardiograms in South Dakota and can be reached at dmwuebben@iw.net. Mark Roozen is a strength coach with the Cleveland Browns and also the owner and president of Performance Edge Training Systems (PETS). He can be reached at mroozen@clevelandbrowns.com.